Akumina, a Nashua, New Hampshire-based workplace intranet company, has raised $7.5 million in Series A funding. This round of funding was led by Richard Berthy (RJB Investments) along with Avanade via Accenture Ventures and Stage 1 Ventures. In conjunction with this round of funding, Berthy — who is the CEO of Foreside Financial Group — was also named as Akumina’s Chairman of the Board. 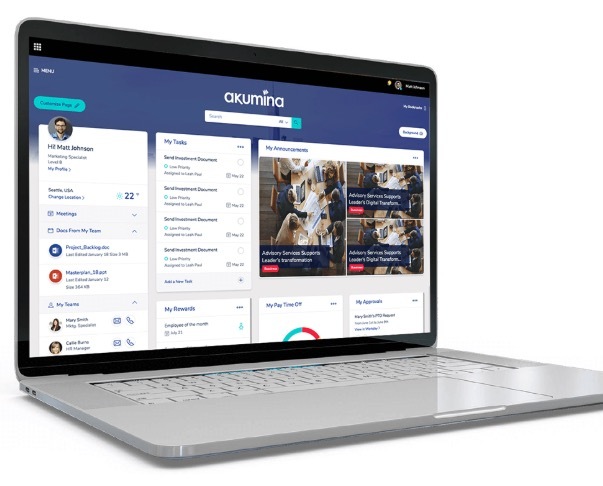 Akumina’s platform replaces shared drives and cluttered Intranets with a centralized hub that works like modern websites, apps, and dashboards. And it integrates seamlessly with the most used enterprise cloud applications such as Office 365. Businesses can use Akumina to create branded and customized digital workplaces to enable employees to become better informed. The World Champion Boston Red Sox baseball team uses Akumina’s platform to bring employees up-to-speed quickly. This is especially important because the team keeps the full-time staff relatively lean and it more than triples in size during the regular season. Brian Shield, the vice president of IT at the Boston Red Sox, said that they tried several solutions but Akumina was the only one that offered built-in functionality along with customization capabilities and cost-effective scale. Akumina saw 191% year-over-year annual recurring revenue growth this past year. And the company’s bookings increased 192% year-over-year from Q3 2017. Some of Akumina’s customers include Whole Foods, GlaxoSmithKline, Vodafone, and the United States Department of Defense.